Railpictures.ca - Dave Beach Photo: One of the scenic highlights of the Algoma Central Railroad is the bridge over the hydroelectric dam at Montreal Falls. For our Labor Day weekend in 1981, several of us arranged with the power company for permission to drive back their private road to hang out and get a few shots at the dam. Once we were back there, one of the employees volunteered that the view was even better from on top of the little cabin they had there. So here’s a southbound freight with 2 SD-40-2′s and 2 GP7L’s and lot of logs on the head end crossing over the Montreal River. | Railpictures.ca – Canadian Railway Photography – photographie ferroviaire Canadienne. 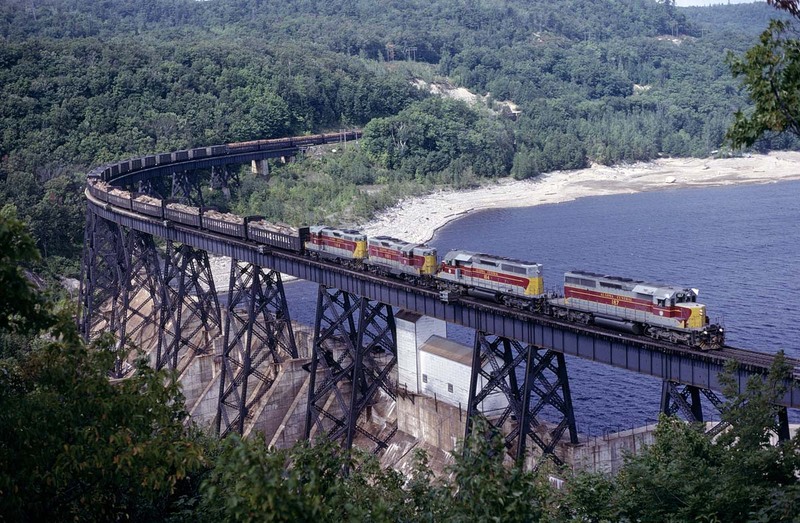 Caption: One of the scenic highlights of the Algoma Central Railroad is the bridge over the hydroelectric dam at Montreal Falls. For our Labor Day weekend in 1981, several of us arranged with the power company for permission to drive back their private road to hang out and get a few shots at the dam. Once we were back there, one of the employees volunteered that the view was even better from on top of the little cabin they had there. So here's a southbound freight with 2 SD-40-2's and 2 GP7L's and lot of logs on the head end crossing over the Montreal River. Dave I’m pleased to announce you’ve won our Editors Choice badge for this wonderful photo. Our editors vote on a number of images and the photos with the most votes win. The ACR is always a beautiful railroad and this is just amazing. Thanks for sharing and hope to see more ! Very nice. Nice catch to get an extra freight rolling across here. Holy Shheeeeeit !!!! Thats a beauty!! !